West Delhi, a major residential hub, has seen tremendous boost in real estate in terms of infrastructure and population in recent years. Being in a close proximity to the Metro, Airport and Gurgaon, Uttam Nagar in West Delhi is spread over a large area, is majorly sought after and very densely populated. Uttam Nagar is totally urbanized comprising of many sub towns. Uttam Nagar is a major populated city which houses a mixed population from all over India because of popular schools, colleges, banks, post offices, entertainment centers and health centers in its vicinity. Uttam Nagar is a prominent residential favorite because it connects to every part of Delhi with the Delhi Metro and the buses. It is also easily accessible by Railways and the airport. This locality brags of well laid roads and transportation. Cycle rickshaws and autorickshaws are very easily available adding to the ease of commutation and access here. Uttam Nagar is commercialized with many posh complexes and buildings including entertainment, government offices, small business corporations and offices of many private companies. It is home to many of the transport authority offices and shipping zones. Uttam Nagar is in close proximity to malls, multiplexes, temples, resto-bars and eatouts. Minutes away from Uttam Nagar, Janakpuri has the Westend Mall, Open Air Theatre and exclusive boutiques. Many major health care centers such as VIVA, B M Gupta Hospital, Biomed Diagnostics are in the locality. There are lots of hoteling options to stay in because of the closeness to the airport. With ease of commutation, the healthcare centers, colleges and market area all in the locality Uttam Nagar is a strategic location for all its residents. Happy news to you frequent flyers, IGI Airport is just 13 kms away. New Delhi Station is 20kms and Connaught place is 20kms away, both major commutation lines. The oldest and the biggest bus terminal ISBT is 18Kms from Uttam Nagar. Uttam Nagar is a full-fledged residential area, therefore no restrictions on moving except to keep in mind the rush hours of the day. Already densely populated, moving to Uttam Nagar requires careful planning and implementation so as to not create stress and chaos for you and the neighborhood. This is where an experienced and expert packer and mover company comes to play. It is very important for you to choose an expert professional packer and mover when you are consider to move in a metropolitan city like Delhi where moving can be a nightmare. It can be more challenging for you if you are home shifting or office shifting within the city with a huge load. Pikkol Packers and Movers with their experience in both local and inter-city can ease the trouble of moving locally. With our motto of making shifting and relocation easy, hassle free and affordable, Pikkol Packers and Movers ensure it’s a pleasurable experience for our customers. 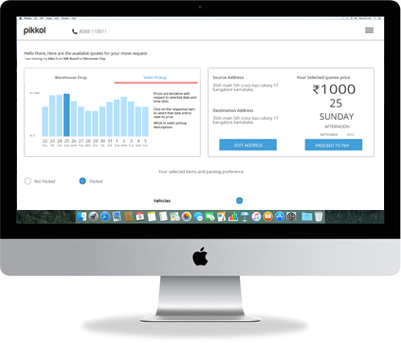 What makes ours a unique service is that Pikkol is a technology-centric enterprise making any relocation a happy one, with the process of packing and moving easy and hassle-free. We provide an easy tracking with timely updates to our customers, from an online quotation, pick up date, dispatch details and movement of your consignment all on a click of a button. Our move supervisors are equipped with GPS enabled devices to provide real time updates of the shipment. So leave all your packing and moving woes to us and enjoy the prospect of moving to a new place peacefully. Happy moving!